The rubber of my table tennis bat is starting to peel off one "corner". Are there any household products I can use to stick it back that will not damage the rubber too much? 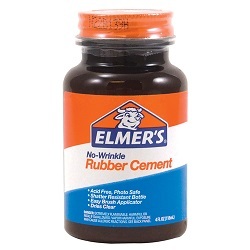 Many players I know, including myself, use Rubber Cement. 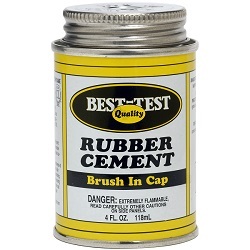 It's cheaper than the "Chack" you get from Stiga, Butterfly, etc, and in my experience, seems to work just as well. It also doesn't leave any bits of the rubber on the blade when you need to remove it. Just spread a thin layer on the blade and rubber surface, let it dry, then attach them. These are the 2 that I've been using for many years. Any (water based) rubber solution glue should do the trick.